It can be hard to assuredly self-diagnose anxiety, because it is natural for all of us to experience periods of worry intermittently throughout life. This means it is often confusing when it comes to differentiating between what is to be expected, and what might constitute a more serious problem. To help decipher the difference, a number of anxiety disorder tests have been developed by doctors and scientists - many of which can be carried out personally at home. Online quizzes. Due to the prevalence of anxiety disorders among modern society, many universities and medical bodies have designed short online quizzes to enable you to find out more about your condition. If using these it is important to ensure you find a reputable and reliable website. Self-evaluation. This can be specifically useful as a social anxiety disorder test. If the thought of exposing yourself to new people, social groups, or crowds is daunting or even terrifying to you, you could be suffering with anxiety. Those who have this disorder often prefer to stay at home, or in the company of just one or two close friends or family members. 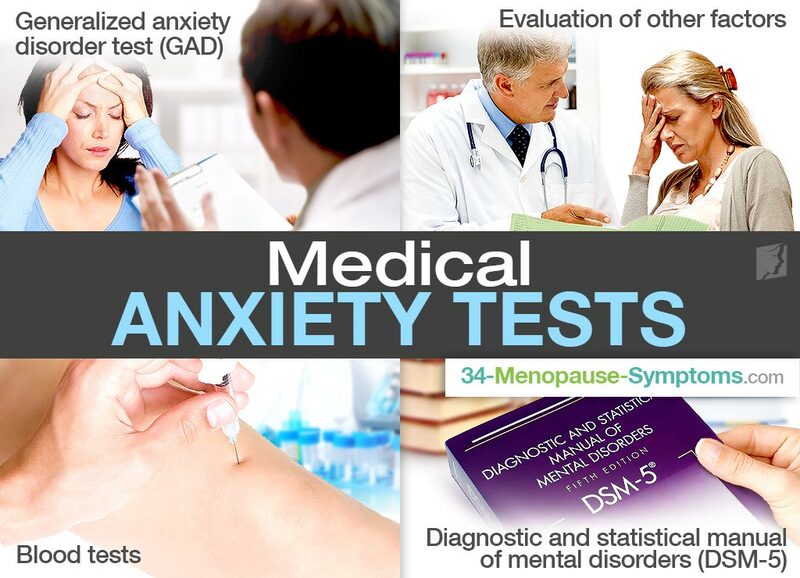 Generalized anxiety disorder test (GAD). This involves a thorough conversation about your symptoms, and how long they have lasted. Questions will relate to the affect your mood has on your day to day life, whether it is manageable, and if you are extremely distressed. If your experience has lasted for six months or more you might be diagnosed with GAD. Evaluation of other factors. Your doctor will likely ask you about other personal habits relating to diet, exercise frequency, alcohol intake, and potential substance abuse. This is because each of these can indicate anxiety, or can worsen an anxiety condition should it already exist. Blood tests. Your doctor might wish to carry out blood tests in order to rule out anxiety symptoms being caused by other health matters. Some conditions, or even prescribed medication can sometimes cause anxiety, unbeknownst to the sufferer. Diagnostic and statistical manual of mental disorders (DSM-5). This certified guide was created by the American Psychiatric Association, and details the accepted signs and symptoms of different psychological problems, including anxiety disorder. It is widely used by doctors to help them accurately diagnose. Diagnosis of anxiety can sometimes take time. It is generally agreed that symptoms need to have been present in the sufferer for at least six months, and additional checks should be carried out to confirm that there is no other condition present. Once a diagnosis has been specified, it will be possible for your doctor to suggest appropriate treatments for anxiety.